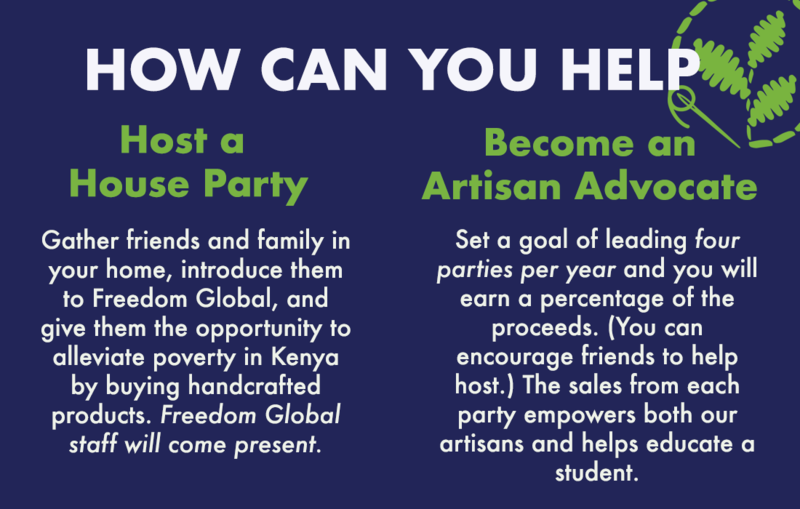 Freedom Artisans, created by Freedom Global, links talented artisans in Kenya with people in the United States who want to impact lives by purchasing their products. The profits from these products are then invested back into giving an education to students at Uhuru Academy. In 2013, Kenya’s unemployment rate was as high as 40 percent. Freedom Artisans has found hard working men and women who have created their own craft stores as a source of income for their families. We then support them by purchasing their products. When an artisan sells a bag, pair of earrings, or other craft it helps them send their children to school, pay for their homes and feed their families. In addition to supporting the artisans’ families, profits earned from Freedom Artisans are invested into students at Uhuru Academy in Limuru, Kenya. Uhuru Academy, an all girls boarding school, is essential in Freedom Global’s mission to alleviate poverty. Research shows that children who go to school are healthier, more confident and more likely to become employed, therefore breaking the generational cycles of poverty. For our artisans like Virginia (pictured above), growing businesses through partnerships like Freedom Artisans means not having to beg for food and money. It also means she can afford to live in her own home. “I have my house now, through this job; so I’m so happy,” Virginia explained. Her coasters are more than a beautiful craft; they are breaking the bonds of poverty for Virginia’s family and supporting our students at Uhuru Academy. Our partner artisans make a wide variety of handcrafted products including jewelry, bags, woodwork, nativities, utensils and more for Freedom Artisans.